Hakimullah Mehsud is shown in a November 2008 photograph. (CNN) -- A video released Sunday by a Pakistan Taliban group features a statement from a speaker claiming to be leader Hakimullah Mehsud in his first appearance since reports of his death in a drone strike, according to IntelCenter, a think tank that tracks terrorist groups. 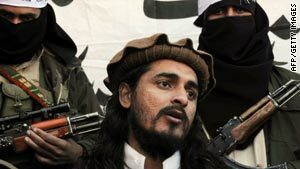 Mehsud, leader of Tehrik-e-Taliban Pakistan, vowed attacks on major U.S. cities in the nearly nine-minute video. "The time is very near when our fedayeen (fighters) will attack the American states in their major cities," the speaker in the video said. "Our fedayeen have penetrated the terrorist America, we will give extremely painful blows to the fanatic America." The video came to light less than 24 hours after an attempted car bombing in New York's Times Square. Video: Pakistani Taliban leader alive or dead? "God willing, very soon in some days or a month's time, the Muslim ummah (worldwide community) will see the fruits of most successful attacks of our fedayeen in USA," said the video, which the speaker said was recorded on April 4. "God willing, in some days or a month, time will prove the success of our fedayeen attacks bringing joy and bliss to the hearts of Muslim ummah." In February, a U.S. intelligence official and three Taliban sources told CNN that Mehsud had been killed in the January drone strike. But the spokesman for the Pakistani Taliban, Azam Tariq, had always denied reports of Mehsud's death. Taliban leaders have denied leaders' deaths in the past. When former Pakistani Taliban leader Baitullah Mehsud was killed in a U.S. drone strike last year, cell phone video of his body was aired on Pakistani TV. A senior U.S. counterterrorism official who asked not to be identified said that if Hakimullah Mehsud is still alive, he should "prove it." "He never had a problem going before the cameras," the official said. "But for the past few months, he's nowhere to be seen. His group isn't one that traditionally led from the cave in silence. His absence is the Taliban's problem, not ours. It's already been shown that he can be hit. As Baitullah Mehsud learned to his peril, if you're a terrorist figure in that part of the world, you have to be smart -- and lucky." Hakimullah Mehsud got Washington's attention when he appeared in a video with Humam Al Balawi, the Jordanian doctor turned suicide bomber who killed seven CIA agents in eastern Afghanistan in December last year. A video, featuring an audio message purported to be by Al Balawi, appeared on radical militant Islamist websites on Friday. On-screen text in the video claimed the message was recorded the night before his attack against the agents. Hakimullah and Baitullah Mehsud were members of the same clan in Pakistan.